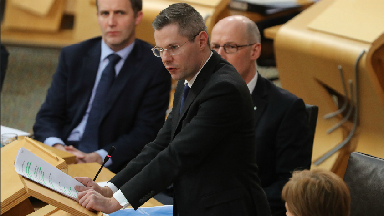 MSPs voted by 67 to 58 endorse Derek Mackay's Budget after he struck a deal with the Greens. The Scottish Budget has been backed by MSPs in the first of three crucial Holyrood votes. 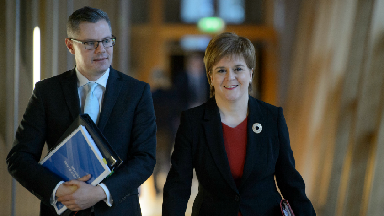 Finance secretary Derek Mackay's tax and spending plans for 2019-20 were passed by 67 votes to 58 after he struck a deal with the Scottish Greens earlier on Thursday. The agreement to give the Budget the support of the Greens through all three voting stages was finalised during talks that went down to the wire before MSPs began debating the plans. The changes grant local authorities new powers to introduce a tourist tax for hotel stays and to charge for workplace parking. They also struck a deal to give councils £90m in extra funding for the coming year. Mackay also announced council tax rates increases would be capped in real terms at 3% for the coming year - which equates to a maximum increase of 4.79%. 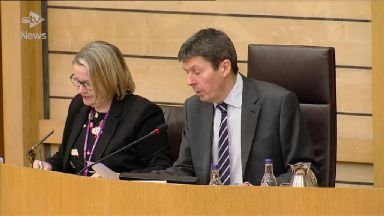 He added that cross-party talks would be launched with a view to replacing council tax altogether, potentially before the next Holyrood elections in 2021. Mackay hailed the changes to the Budget as as a "substantial devolution of power to local government". He said: "The Scottish Government has continued to ensure our partners in local government receive a fair funding settlement despite further cuts to the Scottish budget from the UK Government. "These additional measures will deliver the most significant empowerment of local authorities since devolution and provide additional funding to support local services. "This enhanced package offers up to £187m of increased funding and flexibility to councils, on top of the £11.1bn local government settlement. "In total overall spending power for local authorities next year will be £620m higher than it is currently." Mr Harvie said his party had wanted to use the Budget process "to achieve meaningful change". He said: "The package of local tax reform measures we've seen announced today will make real progress. "We have for the first time a clear, definitive timescale for publishing legislation to abolish and replace council tax during this session of Parliament." Alison Evison, president of the local government body Cosla, said the Budget deal "doesn't mitigate all of our funding issues" and "challenges still remain" for councils. But she added: "We are now in a better place than we were with the original Budget proposal. "I welcome the commitment today to the introduction of discretionary taxation (tourist tax) and the workplace parking levy - it is right that local authorities across Scotland should be able to raise revenue locally to address local issues." But Scottish Labour pointed to research carried out by the independent Scottish Parliament Information Centre (SPICe) which suggests councils still face a £230m funding shortfall. 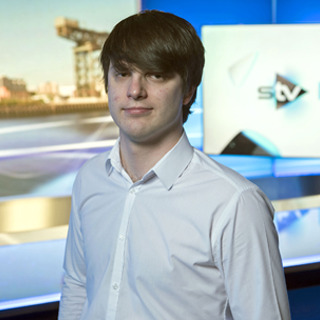 Labour finance spokesman James Kelly said: "The only thing the SNP-Green stitch-up will deliver is cuts. Tax cuts for high earners, funding cuts for councils and budget cuts for colleges and universities." Kelly insisted the proposals would "do nothing to help councils in the coming financial year, who face a £230.7 million cut to funding". 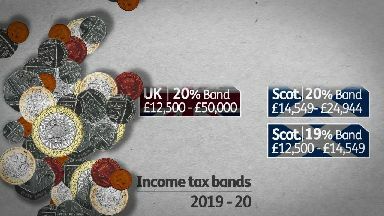 The Scottish Conservatives highlighted that Mackay's income tax plans will mean a growing tax gap between some Scottish and UK taxpayers, after Chancellor Philip Hammond raised the 20p rate threshold to £50,000 in his own Budget. The Scottish Budget will keep the 41p higher rate threshold frozen at £43,430. The Tories slammed the measures on council tax and the new tourist tax, along with the previously announced income tax changes, as a "triple tax bombshell which will do nothing for the competitiveness of the Scottish economy". Thursday's vote was the first of three needed for MSPs ratify the Budget, with the stage two vote expected early February. The final stage three debate cannot happen until a separate vote on income tax rates has been passed, likely to be held mid-February. There was a single abstention in the stage one vote, with former SNP childcare minister Mark McDonald - now an independent MSP - choosing not to back his former ministerial colleagues' plans.